Note: Plant Prtoection Quarterly is no longer published. 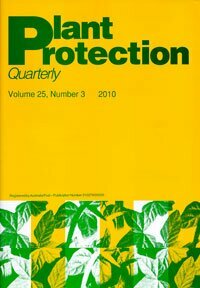 Plant Protection Quarterly is an Australian journal with an international circulation that published original papers on all aspects of plant protection. Topics represented covered all aspects of the protection of economic plants from weeds, pests and diseases and include the protection and ecology of vegetation on public land such as roadsides, railways, national parks, gardens and reserves. Plant Protection Quarterly began life as the journal Australian Weeds published by the Council of Australian Weed Science Societies from 1981 to 1984. It then became Plant Protection Quarterly and was published by Inkata Press from 1985 till 1988. From 1989 till 2011 it was published by RG and FJ Richardson. Polymeria Publishing produced the journal from 2012 till 2016 when publishing ceased. • The notable review series Biology of Australian Weeds is published in this journal. Back issues (hard copy and PDF) up to end of 2011 – available from RG and FJ Richardson. Electronic format – available from the RMIT University Informit e-Library. For more information please visit their website at www.informit.com.au.